At the VLN Endurance Championship’s fourth race of the season, Norbert Siedler and his team-mates Sabine Schmitz and Patrick Huisman only narrowly missed a podium-result. In the heavy rain the trio from the Frikadelli Racing Team crossed the finish line in fourth position and celebrated the best result of the season so far. Also at this weekend the weather in the Eifel-region proved to be unpredictable. Dense fog on Saturday morning caused a delay in the schedule. Norbert Siedler’s team-mate Patrick Huisman was behind the wheel of the Frikadelli-Porsche when the race was finally started at 1:15 PM. “Patrick drove a good first stint. He moved up to third but had a collision with the Land-Audi, who was blocking him. Thereby we lost some time,” Siedler commented. After eight laps the Dutchman entered the pit lane in sixth position and handed the Porsche 911 GT3 R over to Norbert Siedler. “The Nordschleife was extremely wet. The danger of aquaplaning was everywhere,” the 33-year-old described the difficult conditions. 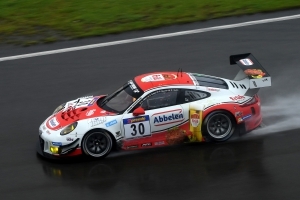 But Siedler kept focused and had a thrilling battle for the third position with the Falken-Porsche. “It was an exciting situation. Depending on how strong the rain was, one of us was always a little faster,” the Nordschleife-specialist described. Siedler’s advance was around six seconds when the Falken-Porsche entered the pit-lane for a refuelling-stop. “Afterwards I could post some really fast lap-times and created quite a big gap until our pit-stop was on the schedule,” the Tyrolean was satisfied. Already in one week’s time Norbert Siedler will be back at Nürburgring. 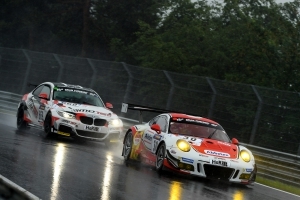 Then the third weekend of the Blancpain Sprint Cup is on the schedule. In the two races the Austrian will share a Ferrari 488 GT3 of Rinaldi Racing with Marco Seefried. The Blancpain Sprint Cup holds the event together with the FIA European Truck Grand Prix. More than 150,000 spectators are expected.